Interactive Lecture Guide for Finance is a thorough and organized supplemental lecture guide for instructors and students. Instead of having students play a passive role in their learning, this book will encourage them to become part of the learning process, making finance more engaging and understandable. Instructors are provided with organized lectures that present the information in a thorough manner, promoting a deeper understanding of the material for their students. 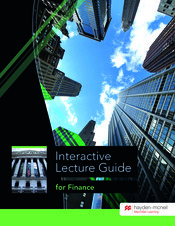 Students will be able to use Interactive Lecture Guide for Finance as a reference point. Instead of focusing on capturing every minute detail in their notes, students can focus more on the lesson and the instructor while taking notes at a reasonable pace.